Superior Steel PP40 4" Rubber Pad with Velcro for Stone Sanding. These pads are aggressive, durable, and gives mirror like finish. Wet diamond polishing pads are used with Wet polishers or wet grinders. It is flexible and can polish either contoured surface like Ogee, Full Bullnose, Half Bullnose, Bevel, Demi or flat surface.It is recommended to always use with water at rpm 2200 for best results. RPM may vary depending on stones and its hardness. Always clamp the stone securely so that it does not move/slip while polishing. Superior Electric BP70 7 Inch Angle Grinder Backing Pad for Resin Fiber Disc. 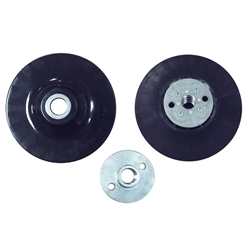 Designed for use with resin fiber sanding discs. Backing pads' exclusive rubber, fabric, and fiber board construction provide extra strength and reliability. Work with right angle grinders or polishing machines. Strong and Durable design gives the backing pads extra suport and extends disc life by upto 30%. Each backing pad is supplied with a nut as indicated. Note: Disc is flat and firm except for where the nut screws down. Superior Electric BP45 4.5" Angle Grinder Backing Pad for Resin Fiber Disc. Designed for use with resin fiber sanding discs. Ribbed surface allows better air flow to extend disc life. Backing pads' exclusive rubber, fabric, and fiber board construction provide extra strength and reliability. Spiral ribs provide contact points and form channels for air flow extending disc life 30% to 50%. 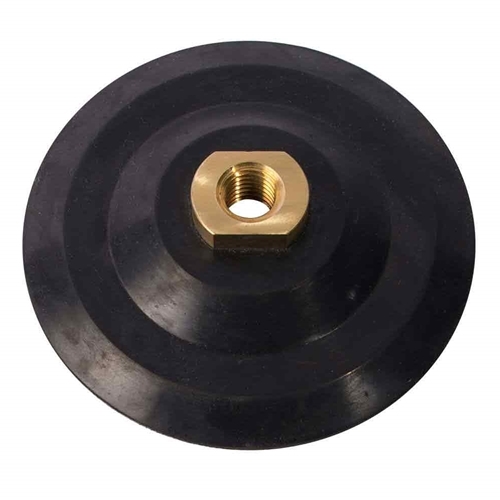 Each pad is supplied with a nut as indicated. Pad built with spiral cooling ribs.